Slice a carrot in half crosswise and it’s easy to see that the veggie resembles an eye—look closely and you’ll even notice a pattern of radiating lines that mimic the pupil and iris. And the old wives’ tale is true: Munching on carrots will actually promote healthy eyes. Carrots are filled with vitamins and antioxidants, like beta-carotene, that decrease the chance of macular degeneration, the leading cause of vision loss in older people. One Comment on "Eat those carrots"
That is so neat! 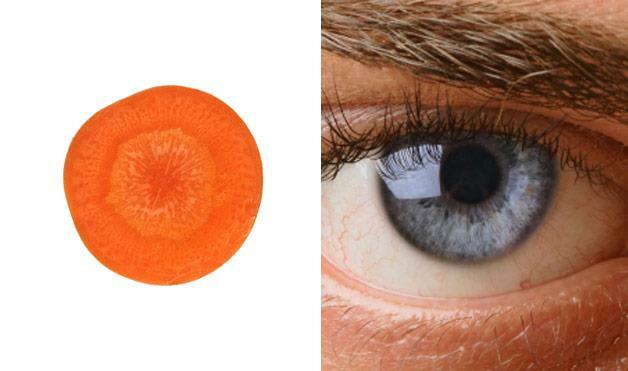 I always heard about carrots being good for your eyes, but I never looked at the inside of one like this and saw what is so obvious! I buy nothing but organic baby carrots which we eat daily.